If you are interested in Southern Africa you will love the Korck Publishing “Mammals of Southern Africa” wall poster! 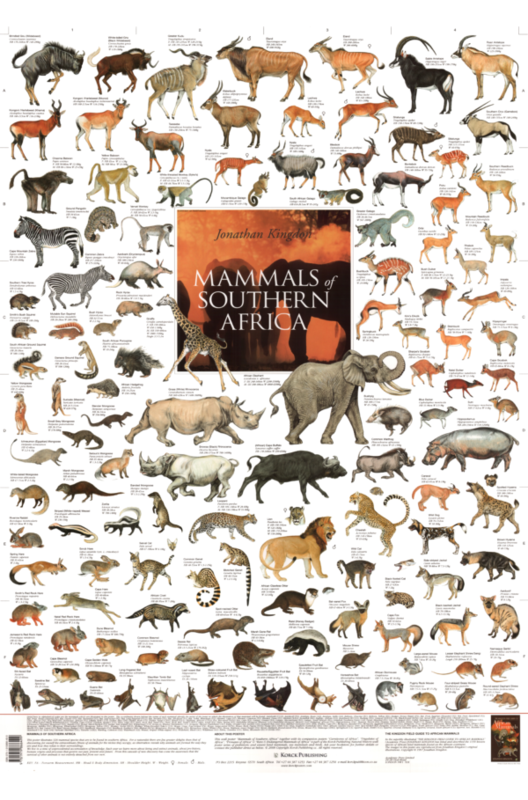 The Korck Publishing wall poster “Mammals of Southern Africa” together with its Fold-out Identification Guide equivalent (folding to 298 mm x 238 mm and thus excellently portable, a superb companion on a game-viewing excursion and with a host of other uses) is the most popular mammal poster ever published in South Africa. The subject matter of course is quintessentially southern African, featuring 124 mammal species that are to be found in southern Africa – all superbly illustrated by Jonathan Kingdon. These are the magnificent creatures people travel long distances to southern Africa to experience. Possess these publications as a deathless record of what you have seen on safari in southern Africa as most visitors here do, or as a memoire of what you must experience before too long! – or alternatively merely as a permanent record of the mammal species which (with over 900 bird species) contribute so vividly to the nature lover’s paradise that southern Africa is today. Click here to read more about the Mammals of Southern Africa Fold-Out Identification Guide.